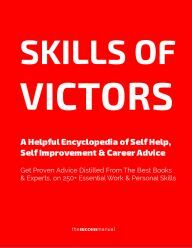 Encyclopedia of Self Help, Self Improvement and Career Advice. Get Proven Tips From 1000+ Top Books and Experts on 250+ Important Work And Personal Skills. In One Book. What Do We Want From Our Job? Running a Business: How will people buy from you?